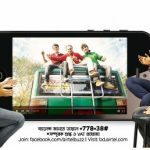 All Robi and Airtel customers are eligible Robi 1GB 30Tk Offer and 0.5 Paisha Callrate Offer.The customers who want active or enjoy this special offer,please read this full article for get all information about Jora SIM Offer. To activate Robi 1GB 30Tk Offer, Airtel and Robi all new customers need to dial *123*025#. 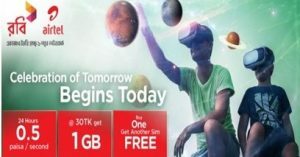 Customers can use this Airtel & Robi 30Tk 1GB data in 24 hours. The validity of this package in 3 days. Customers can activate this special internet pack only one time during the offer period. To check your internet balance, Robi customers need to Dial *123*3*5# and Airtel Customers need to dial *778*18#. The users who want to activate this Special call rate offer, Robi and Airtel customers need to dial *123*25#. This 5 paisa/sec (30p/min, 1 sec pulse) offeravailable for Robi To Robi, Robi To Airtel, Airtel To Robi, Airtel To Airtel. The validity of On-net Call Rate offer in the campaign period. The customers can use this special call rate in 24 hours. If you buy a new airtel SIM, You will get 1 Robi SIM for Free. If you buy a new Robi SIM, You will get 1 airtel SIM for Free. After will get a Free SIM, Customers must be need registration both SIM same NID and Same Retail outlet. 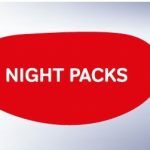 All Robi and Airtel customers are enjoy this offer for all FnF and Super FnF and all Priyo numbers. 1 second pulse will be applicable for this offer. If you active or enjoy Robi & Airtel Free SIM, Customers need to recharge 50 TK in both SIM. The Robi & Airtel campaign will be run until further notice. Now all Customers will be get 1GB 30Tk Offar and 0.5 Paisha Callrate Offer in any time.Have you any question or know more about this offer,please comments the box.We will try to answer all your questions.Thanks all customers for being with us.